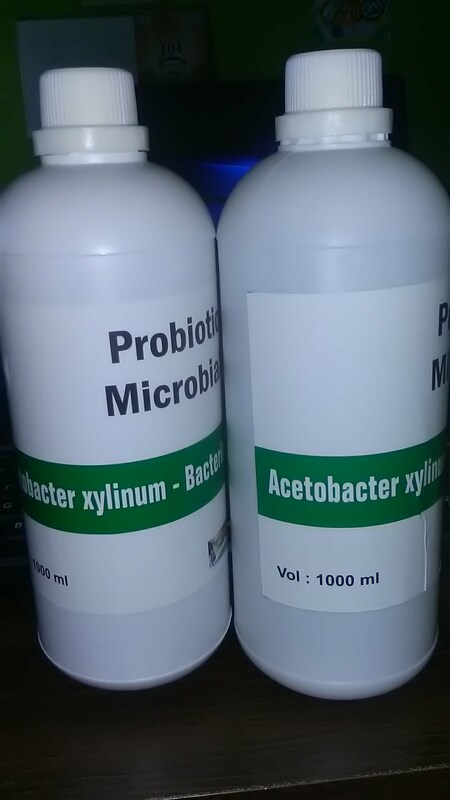 Acetobacter xylinum is classified as Bactiera; Protobcteria; Alphaproteobacteria;Rhodospirllales;Acetobacteraceae; Gluconacetobacter; Acetobacter xylinum. 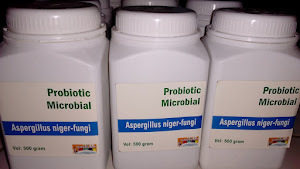 A.J Brown in 1886 identified that Acetobacter xylinum is a non-pathogenic mesophile due to its ability to produce cellulose. In nature A. xylinum is found in soil and is commonly found on rotting fallen fruits. 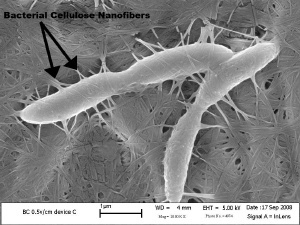 It's exceptional ability to produce cellulose has made it a common choice for researchers studying the biosynthesis of cellulose. 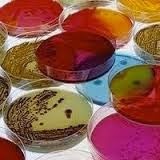 As a model organism it is used to study the mode by which cellulose is synthesized from glucose by bacteria like A. xylinum and to explore A. xylinum's potential industrial and textile applications. The complete genome for A. xylinum consists of a single 3136 kb circular chromosome as well as a number of plasmids which vary depending on the specific strain. So far 3265 genes have been identified and reported on NCBI with special attention to those involved in cellulose biosynthesis. The oporon for cellulose synthase has been identified to contain three genes, acsAB, acsC and acs D.
A. xylinum are gram-negative rods occurring as individuals, pairs, chains or small clusters. When motile, flagella are arranged peritrichously. Cellulase synthase is secreted at pores arranged longitudinally along the cell allowing A. xylinum create a floating matrix of cellulose. A. xylinum is an obligate aerobe which metabolizes primarily glucose which it uses in cellulose synthesis. The floating matrix allows the cells to rise to the surface of a media where oxygen is abundant., he pathway for cellulose synthesis are as follows Glucose (glucokinase), Glucose-6-Phosphate (phosphoglucomutase), Glucose-1-Phosphate (UDP-glucose pyrophosphorylase), UDP-Glucose (cellulose synthase), Cellulose. In nature A. xylinum in found in soil, sometimes in symbiosis with plats such as sugarcane or coffe plants. 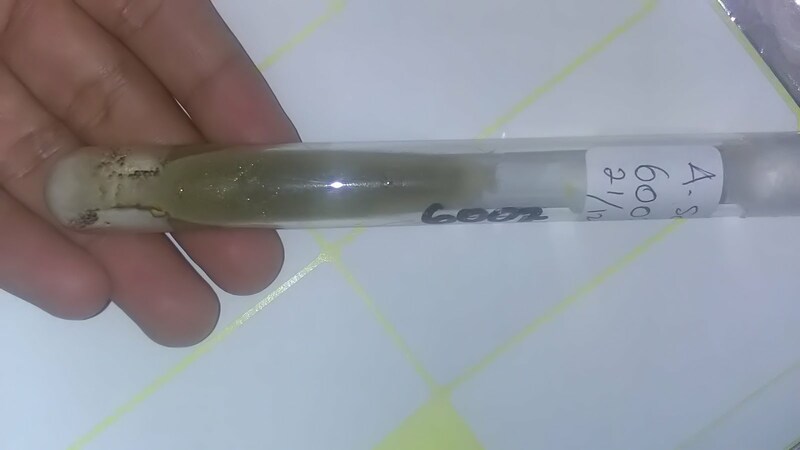 A. xylinum's ideal growth conditions are at a pH between 5 and 6.8 at 30˚C in a complex media consisting of primarily glucose but other carbon sources can be used even in the production of cellulose. 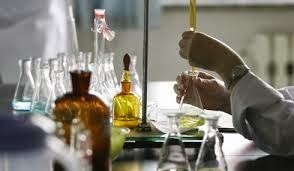 Beyond the lab, potential applications of A. xylinum's cellulose producing properties are widespread and varied. 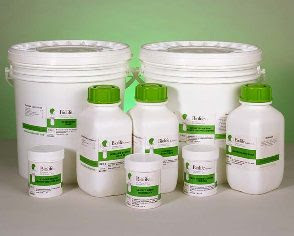 In 2007 a proposal for the potential application of A. xylinum as a "100% biocompatable self-contructing protective packaging" won third place in Bayer MaterialScience VisionWorks Award. This project titled BACS highlights applications including moisturizing packaging for keeping food fresh and creating custom grown packaging. The natural production and biodegradability of the product make it more eco-friendly as well. Other potential applications for A. xylinum include paper making where it could be used to create stronger paper without the need for wood. Other applications include audio components to create speaker membranes from microbial cellulose, wound care using microbial cellulose as molded artificial arteries and skin, and as a drug delivery agent due to microbial cellulose's ability to hold water.